"General Marion Inviting a British Officer to Share His Meal" or the "Sweet Potato Dinner" painting depicts General Francis Marion (1732-1795), also known as "The Swamp Fox." The artist was John Blake White (1781-1859) from SC, whose son donated the work to the US Senate in 1899. 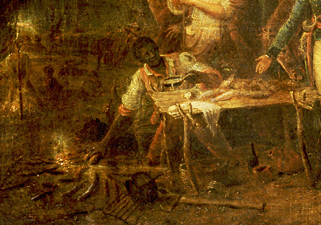 According to the Senate website HERE the White's farm was next to the Marion's, so when the artist was a boy he knew the General. 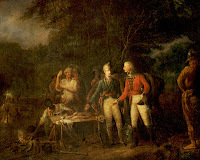 During the time he was with Gen'l Marion, a British Officer as he was told, came to Camp but for what reason he does not know; he was roasting and baking sweet potatoes on the coles –-Gen'l Marion steped up with the British Officer and remarked he believed he would take Breakfast; he felt proud of the request, puled out his potatoes, wiped the ashes off with a dirty handkerchief, placed them on a pine log (which was all the provision they had) and Gen'l Marion and the Brittish Officer partook of them. He had been told by some that this had been recorded in the log of the Gen'l as dinner but this was breakfast. Sweet potatoes are easy to cook on the coals and are delicious. The potatoes can be placed on the coals and turned occasionally, or they can be buried in the ashes and coals. In 1840 John Sartain, (1808-1897) did an engraving from the painting. During the Civil War, in 1861, the image was on the $10 bill of the Confederate States, and on a post war South Carolina $5 bill.